Proposed in 2012, UCCS’ master plan projects the university to undergo $290,050,000 in construction projects within the next three years. Projects include an expansion of the east side of campus near University Hall for academic or administrative office or a residence village, an increase of on-campus housing and a goal to increase the ratio of parking space per-student from .36 to .40. The goals of the master plan include preserving a sense of place, connecting campus destinations, developing the campus in a responsible and eco friendly way and engaging the public in the north campus. Around 13,000 students were expected to be enrolled by the year 2020, according to the plan, though the growth for UCCS has already reached approximately 12,435 undergraduate students and 1,822 graduate students as of 2017. Funding for construction projects in the plan comes from five channels, including tuition bonding, campus funds, fee-based bonding and donations. Fee-based bonding finances cost $123,500,000 in construction between 2016 to 2020. The most expensive addition will occur within the College of Engineering and Applied Sciences. MAE and ECE fees will increase for engineering students starting in the fall of 2018, which was approved during the April 6 CU Board of Regents meeting. These approved fees will assist in lab maintenance and replacing equipment, instructional software licenses and instructional support for students. Kent Marsh, associate vice chancellor for Campus Planning and Facilities Management, said that the construction plans laid out have been followed to this point. 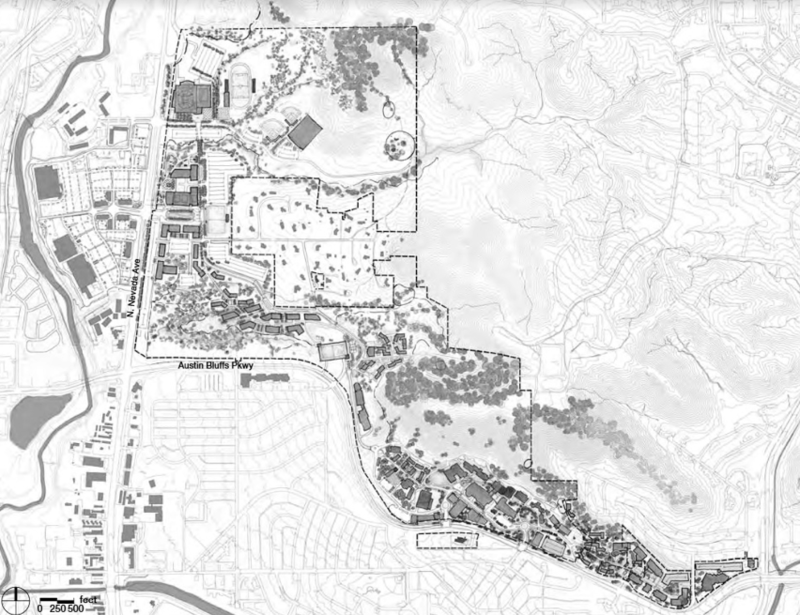 “UCCS has done an admirable job of abiding by the recommendations outlined in the 2012 campus master plan, when determining where new buildings are located on campus, in my opinion,” said Marsh in an email. The next project is the William J. Hybl Sports Medicine and Performance Center, which is already under construction. The center will be the beginning of an expansive health and wellness village, according to Marsh. Like the Ent Center for the Arts, the Sports Medicine and Performance center is an outreach to the surrounding Colorado Springs community. The center will include human performance testing, training, research and education, along with medical-based fitness, athletic training, physical therapy and more, according to Communique. The project was approved in 2014 as part of the City for Champions project, which includes an Olympic museum and events arena downtown and a visitor Center at the U.S. Air Force Academy. Substantial construction is projected to begin in July, and the center and the wellness village is expected to be complete by December 2019. Along North Nevada Avenue, plans for another residence village and multiple sporting fields aligned for a vista of Pulpit Rock are also in the works. The Budget Proposal for the CU system affirmed that the expansion of UCCS may increase undergraduate enrollments rates. The master plan is expected to be completed in 2020.